Decorating for Halloween this year was toned down a bit, mainly because we’re still living out of a few boxes but also because I wasn’t sure about the trick-or-treat traffic in the neighborhood. 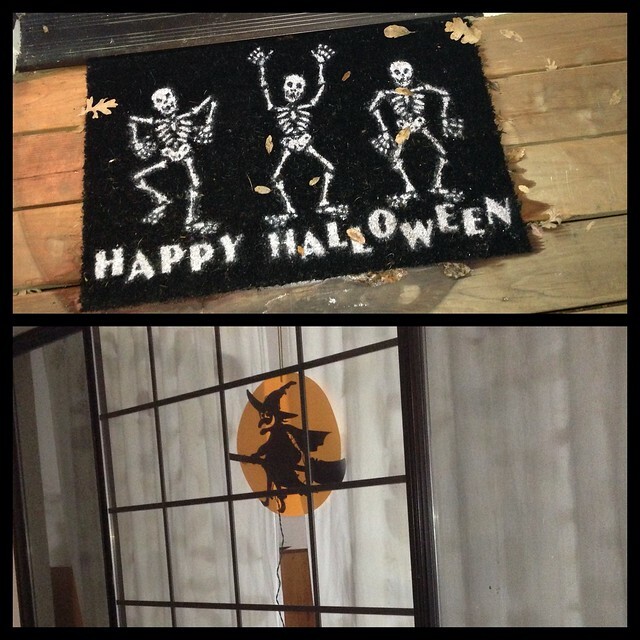 A light in the window and a Halloween welcome mat was the extent of my decorating. I’m not too sad about it because as it turns out we didn’t really have much for trick-or-treaters. We had about four or five small groups of kids. Needless to say I ended up bringing a lot of candy to work. The one thing that was nice about this year’s Halloween is that my family was able to stop by and hang out with us. We watched Casper and handed out candy to trick-or-treaters. Now that I know what kind of traffic to expect, I’d like to focus next year’s Halloween more towards a party. Now it’s time to put away the Halloween decorations (doing that this weekend) and prepare for Christmas! Haha, I don’t even know if you did this on purpose, but the fall leaves on your Halloween mat are perfect. They fit the season so well 🙂 I hope you get to throw an awesome Halloween party next year at your humble abode.